The former Haworth Parish Church had an organ which was built in the time of Patrick Bronte as part of the improvements he accomplished during his ministry. Branwell Bronte played the organ for services from time to time and Charlotte described in her juvenile writings as ‘the stupendous organ’ called ‘rollroarthunderandsqueakandotheroreimus’. A church in Lancashire now claims to have this organ. The present church was built in 1879 and, when new, the music was provided by a harmonium. The present organ was built in 1883 by J J Binns of Bramley, Leeds and was opened on October 15th by William T Best. The console was situated underneath the organ behind the choir. Both Swell and Choir organs were enclosed. 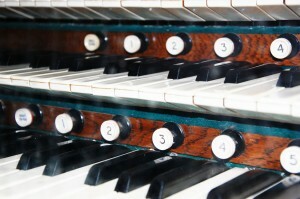 The organ was hand blown with mechanical action and the coupling facilities rather sparse. It has three manuals, 33 speaking stops, seven other stops and 2,064 pipes. The tone was described as “full and powerful”. Records of work done on the organ before 1966 appear to be none existent. During 1967-1968 Laycock and Bannister of Keighley provided electric action and re-sited a detached console to the right of the altar rail. 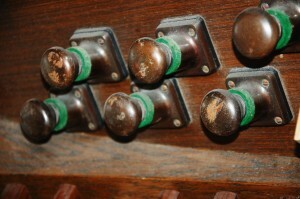 The console, which originally had draw-stops, is from a Compton organ and came from Priory Church, Bridlington. This work greatly increased the coupling facilities and cost £2,100. In 1975 the organ was completely renovated by John Corkhill of Wigan. The removal of the choir ‘box’ left the organ un-enclosed. The blower was also re-sited in the organ chamber. This work cost £3,000. Since then the console has been moved twice. In 1991 Michael Fletcher of Shelf, Halifax moved the console to the front of the nave. It is connected to the organ by only 19 wires. The blower was moved back to its original site in the boiler house below to make way for the Pedal ‘Trombone’. 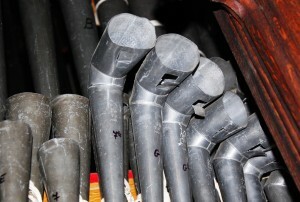 The organ was overhauled and several stops from St James, Bolton, Bradford were added. Most worthy of note is the Pedal ‘Trombone’ which along with the ‘Trumpet’ can now be played on the Great, Pedal and Choir organs. Solid slate coupling was fitted and the Choir organ was again enclosed. The cost of this work was £10,000. Today, the console stands at the front of the South Transept. Tuning and maintenance of the organ is financed mainly by the sale of five hymn tunes composed by Jack Rhodes, former organist, to poems written by the Bronte sisters. The Church will be forever grateful to Mr Rhodes, who donated the copyrights to safeguard the future of the organ. Regretfully, this beautiful historic organ is in need of major restoration, largely due to a break-in at the church and vandalism in 1980. A quotation in the sum of £58,500 has been received for the restoration of the organ although some restorative measures have been taken by John Barnes of Corkhill during the last three years . Music is an important part of any church service and many people will have enjoyed weddings, christenings, Christmas celebrations and other memorable occasions at Haworth Church, which may not have been as memorable or joyous without the resonance of the organ. A number of events are being organised in order to raise funds and we would like to thank anybody who is able to support these events and/or make a donation, no matter how small. Please see the local media or visit St Michael and All Angels Church in Haworth for details of future events. You can also find information on our website www.haworthchurch.co.uk. Everybody is always most welcome to join our Sunday services at St Michael and All Angels Church on Sunday morning at 10.45am and to hear the organ playing.